Majorly hating on the NHS at the moment.. i understand that they have a lot of people to care for etc, but sometimes i kind of wish my parents had enough money to pay for all my health care privately. I have so many medical issues, and some appointments just take forever to come through and when your in so much pain or whatever, it really gets to you having to waiting ageees. Makes you feel kind of forgotten about if i'm honest. Like, remember me saying a few posts ago how i decided to go back to Induvidual Therpay because i thought it was necessary? Well, that specific sector can send me like 2 letters about something totally irrelevant, yet not assign me an Induvidual Therpaist even though i know i need to see one for many reasons. I let things bother me way to easily, and things eat away at me and play on my mind forever, i bottle more or less all my true feelings up and i sometimes don't even feel i can talk to my mum or Sam about them, and they're the two closest people to me whom i feel i can trust solely. Meh, ahwells, spose' i'll just have to keep waiting.. although my GP is going to go mental when she finds out they still haven't assigned me an Induvidual Therpaist, but hey ohwell. Whats your opinion on the NHS!? Have you also been let down by them? I'm sorry i still haven't managed to take a picture of my car or blog properly yet. This is the only pic i've taken and i took it while driving behind it on the way home. 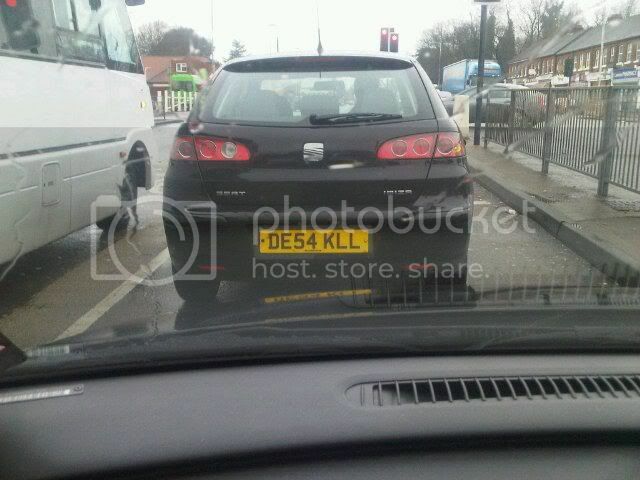 Bet you thought i was all lying though when i said my car numberplate looked like it read 'DEATH KILL' haha, well you can judge for yourself! My M.E's been really bad last 2 weeks and i think thats my reasons for not blogging as much, i just haven't had the energy. Me & Mumsy are going to go check out a couple Charity Shops tomorrow, see if i can find a few nice bits & pieces.. waiting for 2 deliverys to come from Ebay too. This purple tunic with some nice crochet detail around the neckline, and a ruffled skirt. That skirt is a must have. I also purchased a beige cobweb snood which my friend Abby found on Ebay and we both decided to get one. Will upload pictures when they come through. Going to leave you all with a quote which has kind of been keeping me sane recently. Percieve it how you will, but it means a lot to me, because just as i think of giving up on something because i don;t like it BAM this quote pops into my head. Hope you all have a good weekend lovelies! It'll all be okay in the end. If it's not okay, then it's not the end. Why don't you get a job and pay for your own health care. I can't believe how selfish you are, saying your parents should earn enough money for you to go private. At least we have health care here. I agree, what a selfish thing to say "my parents should earn more so I can go private" that's what you mean. We have one of the best and most envied health care systems in the world so you have to wait, at least you get it free, if you were in the USA and didn't have insurance, you'd get nothing. God be thankful for what you have. :( I don't live in Britain so I don't really understand exactly how health care works there but I really hope eveything gets better, I've had a lot of struggles with health/mental health over the last year and making appointments always take extremely wrong but it's true that at least our countries have health care and coverage! I think those above comments are a little harshly worded (there are nicer and more polite ways of saying things). We are highly fortunate to have the NHS in the UK (and most of us contribute to this cost through our taxable earnings) and there is a massive strain on the service at the moment, particularly in light of recent budget announcements. However, there exists a sort of 'postcode-lottery' regarding treatments available to patients and waiting times for these. I've been thankful for the NHS on a number of occasions and have had excellent care at times when I've been really sick. However, I'm currently on a quite a long waiting list for a procedure which could affect my ability to have a family in future and it's really annoying when you hear of people getting 'cosmetic' and weight-loss procedures (gastric bands and the likes) on the NHS, yet they tell me I have to wait months for something that is not my fault. woah, I think previous comments don't fully understand how healthcare works here.. Yes, we are lucky to have it when its something minor, and not a reoccuring problem... like a broken wrist, however for things that need extra people or specialists and an ongoing treatment things aren't perfect to say the least! I know exactly how you feel, my sister is struggling to get appointments with specialists and she has been suffering for about 5 months without anyone telling her what the root of the problem is, or how to make it better.. our whole family have felt forgotten about due to the way the NHS handles its patients. I realise with the recently spending cuts that things are very difficult but I really don't think a bit of organisation would hurt... Letters and prioritising patients and explaining reasons for the wait would be much better than waiting in silence for something that is making you fell sad and worried. its the least they can do. Keep your chin up, eventually you will have your treatment. I read this and just wanted to let you know that there is someone that knows (a little bit) how you feel. and to the anons, why be anonymous if thats your opinion! You have used the anon mask to be rude and horrible about something that you both clearly don't know much about! I think that quote is lovely. I don't know much about health care anywhere, really, I'm so unworldly! But I know that you will be okay, darling. Keep on truckin, lady! That quotes got me thinking and I uthink the anons have got the wrong end of the stick. Also I believe you shouldn't have an opinion at all if you're not proud enough to show your identity. that's the age old arguement, if you're anon you're wrong. I don't have a blog so can't "show myself"
Or you can be like me and at least show your name! Those above comments make me sick; it must be horrible to have your condition and feel like you're ignored by the so-called 'brilliant' NHS. I've been let down by hand specialists, who didn't listen to me when I said something was wrong, enabled the situation to worsen and overall awful care, possibly 'cause I was about 12.